Van Harden’s pizza is gluten-free. 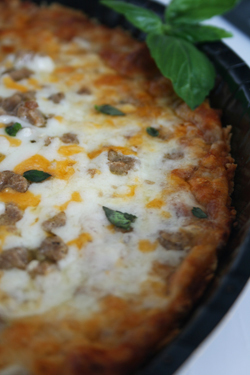 It uses a cheese-based crust. Photo by Hannah Kaminsky| THE NIBBLE. ERIKA MELLER is an Editorial Assistant at THE NIBBLE. No Wheat Allowed? No Problem! CAPSULE REPORT: From the crisp crust to the melted cheese, we love everything about pizza. But for carb counters and, more importantly, people with gluten allergies, that crust presents a problem. Millions of Americans can’t tolerate a protein in wheat, rye and barley—and, therefore, traditional pizza crust is verboten. While it’s possible to buy gluten-free pizza crusts and make pizza from scratch, Van Harden offers a faster solution: frozen pizzas in three varieties with no bread crust whatsoever. The crust is made from cheese, which gives the nearly 3 million Americans with Celiac disease, people with less severe wheat allergies, everyone on the Atkins Diet and carb counters in general a heat-and-eat way to enjoy pizza again. Van Harden doesn’t have a gluten allergy, but one day he stopped eating bread. Though he didn’t miss sandwiches or buns, he did miss his all-time favorite food: pizza. He was surprised to discover that his invention also benefits those on a gluten-free diet, including people who have Celiac disease; as well as people who stick to a low-carb diet (it’s an Atkins delight) and those who simply love cheese. Because Van Harden’s pizza has no wheat or grain of any kind—it’s all cheese! And his frozen pizzas are a real find for those who long for pizza but can’t have the gluten or the carbs. The actual crust is thin and soft with a delightfully slightly burnt-cheesy taste. 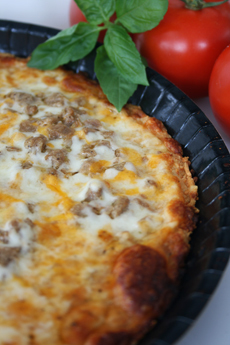 While these cheese crust pizzas are heavy on the cheese, they are exceptionally light on the tomato sauce. 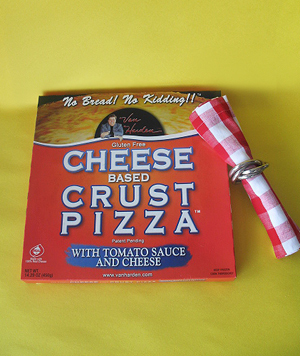 Due the proprietary process that creates the cheese crust and bonds it to the cheese topping, the pie is flattened (think “ironed flat”) and the tomato sauce is minimized. It’s a great way of creating a carb-free, bread-free crust, but something had to go—in this case, the typical amount of sauce. But you can compensate and add extra sauce (more about this later). Cheese Pizza. This is the only vegetarian variety in this line thus far, though Mr. Harden said his team is working to develop a cheese crust pizza topped with vegetables for veggie lovers. Pepperoni Pizza. This pizza staple comes with tomato sauce and about a dozen full-sized pepperonis. We cut up each pepperoni into four triangles so we could have a bit in every bite. Sausage Pizza. Van Harden's sausage pizza includes tiny bits of sausage dotting the cheese throughout the pizza. It was the group favorite, and it’s the company’s best seller. One of the challenges of making a pizza that is largely cheese is the salt content. If you like your food salty, you won’t find fault with Van Harden’s Pizza. If you don’t typically have a salt shaker on your dining table, you’ll opine, as we do, that the company needs to figure out how to shake some of the salt out of the pizza. As the company grows larger, it may be able to contract for some low-salt Parmesan and Romano cheeses for the crust. Topping the pizza with fresh or diced canned tomatoes (our favorites by a long shot are San Marzano tomatoes). Or, if you’re not a neat freak, add pizza sauce to the top (try the new Lucini pizza sauce!). Adding fresh basil—lots of it—helps to counter the saltiness. Photo by Hannah Kaminsky | THE NIBBLE. Also available in Hy-Vee retail stores in seven Midwest states. Van Harden's pizza comes in three varieties: pepperoni, sausage and cheese. Photo by Erika Meller | THE NIBBLE. 2009 Lifestyle Direct, Inc. All rights reserved. Images are the copyright of their individual owners.